We sell Simply Organic products like Simply Gentle Organic Cotton Pads online in the UK and directly from our award-winning store in Scotland. Organic cotton is farmed with more traditional methods that use no synthetic chemical pesticides or fertilisers. These cotton wool pads are made from Fairtrade certified cotton which is grown by small-scale farmers in India. We sell real Simply Organic and other Accessories directly from our shop in Scotland and online throughout the UK. View more products from Simply Organic. Where can you buy real Organic Cotton Pads safely online? If you are wondering where you can buy Simply Gentle Organic Cotton Pads safely online in the UK, then shop with us. We are an actual health foods shop; with real people selling real foods and products. Our award-winning independent shop is located in Stirling, Scotland since 1976. You can buy our Accessories in store or safely place an order with us online or over the phone. 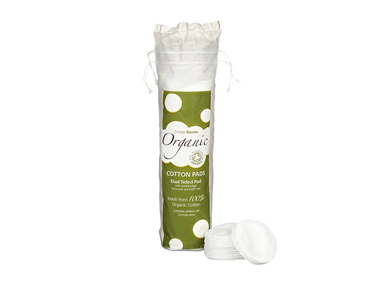 Organic Cotton Pads - Simply Gentle Organic Cotton Pads in Accessories and Personal Care.